(Brussels) – The European Parliament and the European Council should postpone the ratification of the proposed EU-Vietnam Free Trade Agreement until the Vietnamese government takes concrete steps to improve its increasingly abusive human rights record, Human Rights Watch said today. In Vietnam’s latest move to restrict rights, a new draconian cybersecurity law went into effect on January 1, 2019. The European Commission, mandated to negotiate an economic agreement with Vietnam, presented a final version of the deal in October 2018, planning for the European Council and Parliament to give their final approval – necessary for the agreement to enter into force – before European Parliament elections in May. Because of pressure from Europe’s business community, some parties in the European Parliament are now trying to rush forward with the trade agreement, known by its initials, EVFTA, even as Vietnam has ignored repeated calls to address its human rights record. Key procedural votes on the agreement are scheduled for next week. 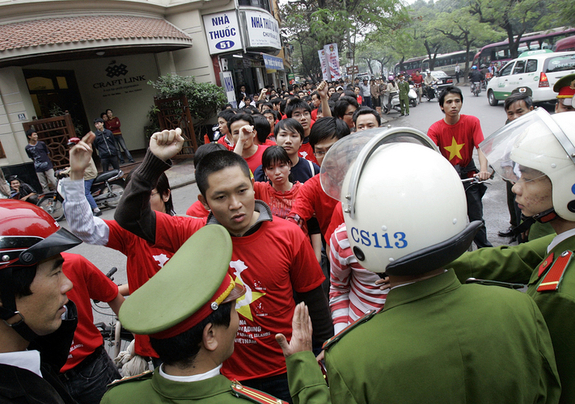 In September 2018, 32 members of the European Parliament signed a public letter raising serious concerns about Vietnam’s ongoing crackdown on human rights and calling on the country to improve its human rights record ahead of any vote on the deal. The same concerns were raised with Vietnam’s deputy trade minister in October at a debate in the European Parliament, and again in an urgency resolution in November. Unfortunately, none of those calls were met, and the government’s crackdown has only intensified. Vietnam’s new cybersecurity law appears to be aimed at shutting down the only avenue that was left for Vietnamese people to express their dissent, in a country where all media are state-owned or state-controlled and activities by nongovernmental groups are severely restricted. Scores of peaceful bloggers, critics, activists, and religious leaders are in prison, for overly broad offenses that criminalize free speech. Those who still speak openly risk beatings, arrests, threats, and other abuses. Independent trade unions are not allowed to operate, and the bulk of the country’s past pledges to ratify several International Labour Organization (ILO) conventions remain unfulfilled.